Because I have two RV-related websites, I probably subscribe to more RV-related newsletters than most. Definitely more than I actually find the time to read consistently. But I’ve started to use the same logic for decluttering my inbox as I use for my closets: if I haven’t opened or looked at it in the last year, it’s time to get rid of it – to unsubscribe. Wouldn’t it be great if one newsletter could cover all the RV news that really matters? Good news - there is: RV Travel. Although I continue to subscribe to several others, I realized that the one I never miss reading is RV Travel.com. I've never personally met the editor, Chuck Woodbury, but we’ve had several conversations over the years. Invariably, we’re on the same page and share the same opinions. We’re both passionate about helping people enjoy the RV lifestyle as affordably as possible. More importantly, Chuck is always advocating for the interest of RV owners – often when no one else is. And sometimes despite blowback from RV industry big boys like manufacturers, dealers, and campground associations. As well as his main weekly newsletter, he publishes several subsets you can subscribe to depending on your specific interests. Two examples: The RV Daily Tips and The No Shock Zone (all about RV electricity). Every Saturday morning, I know I can count on catching all the news that matters to me personally as well as items of interest I might pass on to you, our users, by reading this one free newsletter. Best of all, Chuck doesn’t just cover a news item, he often digs in deeper to offer help and support whenever an issue crops up that affects RV owners. A recent example was this article where he outlined the legal obligations that Roadtrek owners need to be aware of, and any actions they may be able to take advantage of, to protect their investment and their warranty now that the manufacturer suddenly declared bankruptcy. Plan to clear out that closet to make room for new clothes that you’ll actually wear! 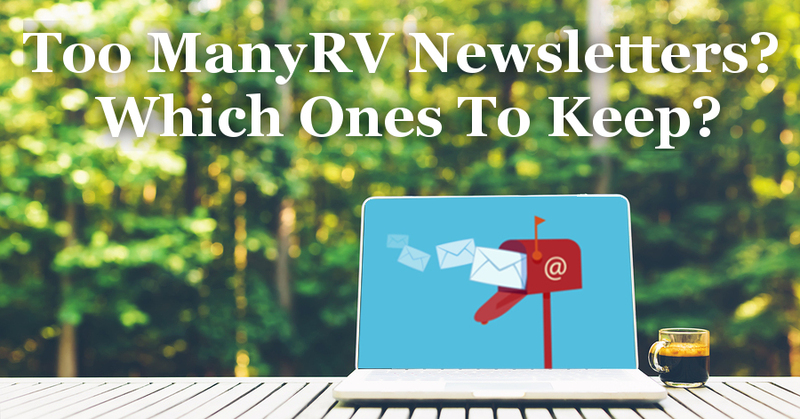 At the same time, why not clean up your inbox and, if you're not already a subscriber, make room for the one news source that will cover everything you need to know: the RVTravel.com newsletter.